My husband and I, like many parents, love to provide for our children an enjoyable life full of enrichment, love, and joy. However, overindulgence without responsibility will lead to entitlement attitudes and dependence. This is the opposite of what we intend to develop in our children by showering them with our love and gifts. 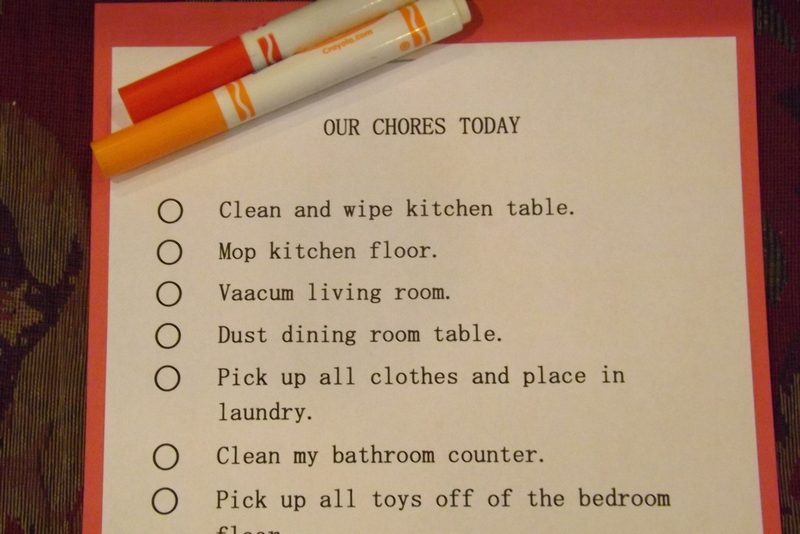 One important tool to help your children grow to become responsible and self-reliant is to assign the children chores, even if you have a housekeeper. There are some basic chores that my children are responsible for during the week, e.g. picking up their dishes after dinner. However, Saturday morning in my house is the “big clean”. I prepare a checklist and tell them specific times for when I will check their work. Honestly, I was a drill sergeant the first few weeks, when I started this process. However, over time as these chores became the standard, the drill sergeant starts to fade and resurfaces, only when necessary. I even give them a 30 minute warning before the big clean begins. Be consistent: Your children may not be willing participants at first. However, stick with it. Overtime, it will become the norm. Select age appropriate chores. For example, I limit access to areas, like toilet cleaning, due to risk of exposure to germs. For toddlers, it may be picking up toys. For school age children, you can add placing laundry in the correct location, cleaning the kitchen table, and picking up dishes. Be patient: Your child may not get it done right the first time. Teach them as you go along, while decreasing your involvement in the specific task. Be encouraging: If you have a negative attitude towards their work, so will they. Help them feel supported and appreciated for a true good effort. Also, when assessing the cleanliness of an area, be encouraging for recognizing good effort and coaching on specific ways to be more efficient or getting areas that were missed. Be firm: When the effort is lacking from your child, be firm and clear in your expectations followed up with consequences for disobedience. Make it fun: Play music, open the windows, sing songs, and even make a game of it. You want your child to have a sense of pride of the work they completed. I love when my child says, “Mom, come look.” As I assess the space they have clean, I sense their feeling of accomplishment. I praise them for it, which is encouraging for them. I am not always sure, if I am doing the right thing. However, this is one area I am confident that I am. One added benefit for you is the additional help around the house. Now, that is marvalous!